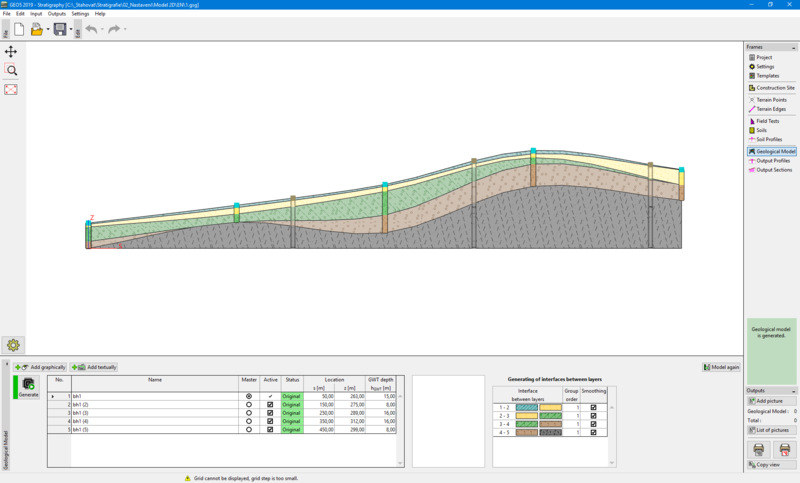 The 2D mode allows to model a 2D cross section from "Boreholes" and "Terrain points". This mode is appropriate for line constructions or for modeling difficult cross sections and slopes - after completion, it is possible to extract this model to 3D model and edit it. In the 2D mode, the program has just one view - it is not possible to switch to 3D view. Work is exactly the same as in 3D mode - only simpler with one dimension less. Construction site boundary is always defined as a "Rectangle". Only coordinates Smin, Smax are entered or calculated. Terrain points, Tests, Soil profiles, Boreholes, Output profiles 1D, Output sections - there is no input of coordinates x, y (only S). Geological model - In the drawing, the "Shape of terrain" and "Layers" are not visible (defined). Cross section is displayed in the range Smin, Smax. Output sections - there is an automatically created cross section in the whole task length. This output section cannot be deleted. The "z-axis multiplier" is an important tool in 2D modelling of large slopes with small cant. 2D model can be switched to 3D model in the frame "Settings". In this case, dimensions of "Construction Site" in Y-direction are set as Ymin= -S/2, Ymax=S/2 and the type is changed to rectangle. Coordinates S are tranferred to X.